I've seen an abundance of newcomers lately interested in acquiring a parrot. While it is great that people are interested and feel the time is right for them, it seems that many fail to realize the real costs of owning a parrot and I think it is often over-looked by the desire to have a companion. Parrots are not for those without some sort of income, but you don't have to be rich to own them, either! I think it would be great if everyone could share what parrots you own and what goes into their care with a quick breakdown of what it costs per month, money-wise, to give our fids a happy life! I'll go first! I have two cockatiels. I adopted them from someone for $75 and they came with two nice cages and a little bit of their food. Their first avian vet visit was a wellness check and for the two of them it was a little under $100. Every month I spend about $25-30 on their food and treats. This also includes the CHOP I make them too. They get a good variety of pellets, CHOP, spray millet and a better quality seed mix. Food is the their biggest expense, as they aren't destructive with their toys and aren't big chewers. In conclusion: The initial cost of getting the birds and cages with gas money, vet visit and additional food was around $340. The cost of owning them per month continues to hover around $30, which mostly consists of their food and treats but occasionally extras. I sincerely hope this helps someone who is thinking about getting a parrot but is not sure of the long-term costs! Last edited by itzjbean; 11-09-2017 at 10:14 AM. Wow, and that's with low start up costs as well! For us, we had the cage ($400), the parrot ($1750), first vet visit ($200), food/toys ($100)... and that was just to get through Day 1! Monthly we are in the same range of food/treats (about $30), but our Zon chews up toys at a rate of about $25-50 a month, depending on how many we have time to make for him. As a fairly new parront, I knew it would be expensive and we planned ahead. We had a bird fund savings account that we got to $3000 before we considered getting him, and there's a monthly amount we put into that account to have "just in case" funds. We had the opportunity to adopt a "free" CAG not too long ago. He would come with his cage. But the vet costs of evaluating a new bird and checking labs (20 year old CAG on a seed diet... gotta expect some Calcium issues) was well over $500. Turned out "free" got expensive really quick. Thank you for sharing your wisdom and helping educate people prior to making a potentially life-long commitment! Toys, new perches, new bowls, lining etc...every time you hit the pet store or go on amazon $10-30 month call it 10 on the low end. So every 6 months like $225 routine feeding and maintenance, and this is with no health issues. For one bird.... A small GCC. $650 up front, and on average about $37 bucks a month ongoing, for the next thirty years or so. Well my flock is large and fluctuates so I'll try to go with what I expect someone adopting one of my babies to spend. 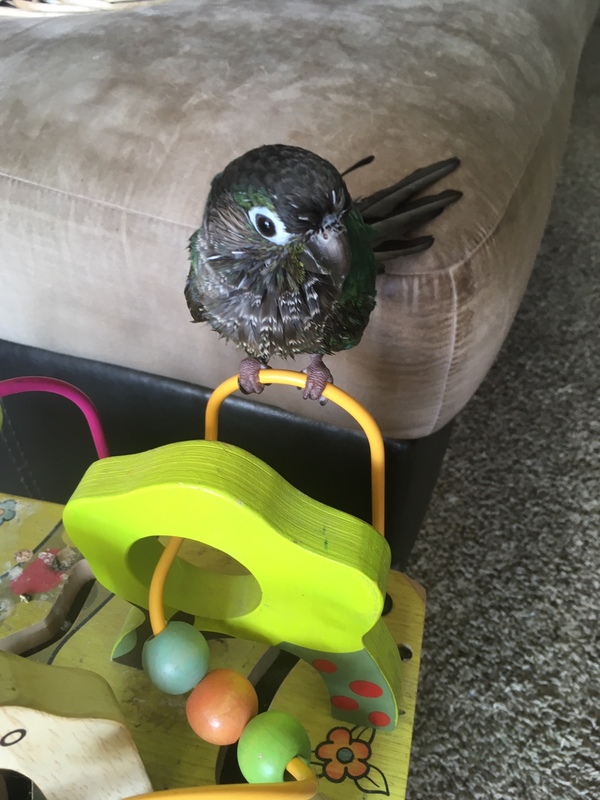 Indian Ringneck Baby: $300-$900 depending on mutation, temperament, and training. Plus I'm a firm believer that it's wise to have at least $1000 emergency vet fund and at least a year's expenses for bird care in the bank before bringing him home. Can you do it for cheaper? Yes you can, but most people don't want to put in the effort, or don't have the time, etc. keep in mind this is the cost of a SMALL bird and doesn't include expenses like replacing things they destroy. Here, enjoy a wet birdie pic of Titan, one of my most expensive "free" birds! I have a flock of one, a very common avian pet A GCC; a cockatiel would be about the same.....I think my numbers are about right to point to for a beginner that "OH I thinks me want's a bird!!!!" You can quote my post in any future thread, which I think is the point of this. Good topic as prospective bird caregivers tend not to think past the cost of the bird. I don't have any numbers but I would encourage one to think hard about this. The bigger the bird, the more expensive the upkeep. Toys, cage, perches, bowls, paper for the bottom of the cage, cleaning solution, manzanita trees (I have 2), seed mixture, pellets, vegies, chicken, salmon, stainless steel clips for toys, skewers for vegies and toys, travel cage (for car), backpack for outings, toy parts to make and refurbish toys, and a $1000.00 backup fund for vet bills. You can plan that these expenses will be recurring as even cages need to be replaced over the life of the bird. I tell people that if they are can't easily afford the cost of the bird every year, don't get it. Yes, you can cut expenses but the question is should you. Birds are expensive to keep, no way around it and remember, this can be a lifetime commitment (your lifetime), again depending upon the breed of bird you get. Our Amazons, commonly come to us, no cost to purchase. On occasion, there maybe some 'unpaid' Vet costs that need to be handled. That all said, we pick-up those Amazons that are more commonly referred to as 'Yesterday's Trash" those left behind at Vet Client(s), Rehomes, etc... These guys and gals are sick and /or injured and have no want to ever trust another human ever again. Yes, those of you that have been around the Forums have seen the above from me in past Posts, but based on the number of new members, one Thread Wonders, and the 'Observers' that never become members, it is worth stating where I'm coming from. Yearly Vet Costs: 2,000 to 2,500 USD per year. Medication Costs: 600 to 800 USD per year. Food Costs (Dry Foods and Pellets, fresh Veggies and Fruits, etc. ): 700 to 800 USD per year. Major items (Cages, move-able Perches, Travel Carriers, etc. repair, replacement - based on rotation '10 year' usable life) Budget 200 to 300 USD per year. Toys and natural branches for Perches, Full Retail: 960 to 1,200 USD per year. Yaaaa, I track the costs as part of our budgeting structuring. FYI: I elected not to include the Cost of building and maintaining a First Aid Emergency Medical Kit, which developing a well stocked kit can easily obtain 1,000 USD to build and 50 to 100 to maintain each year based on use and watching date codes. All depends on the type of Parrot doesn't it. For Xander my Quaker parrot, the start up cost, cage, toys, food and him was around £500. Then you get the experimental phase for trying different foods and toys to see what your Parrot likes which cost maybe another £150 for me. I would estimate £50 a month to keep Xander, food, new toys, treats, cleaning ect but I do spoil him, that's my choice as I don't have children. I am really learning a lot with all of these great responses. Some of these I would have NO idea about, especially Sailboat's post, wow those medical costs! The cages and travel carriers, also can be a huge expense but well worth it in the long run. Start up costs for me. Initial vet exams $200 but Layla has had ongoing issues so we are up to $1000 for her within the first 6 months of ownership or so. Plus all the extras...paper for the cage bottoms, cleaning solution, travel stands, water bottles and crocks. I’m very lucky that I can afford bird ownership because it is not a cheap venture that’s for sure.